"Mom! Can I go help Trevor?" I heard his little voice from across the parking lot. One of the families who lives and works at camp has four kids- and the two boys in particular, well, they really like to follow my husband around. The boy sprints across the gravel toward the golf cart; a wooden sword, pushed under his tiny little belt, knocking against his knee as he runs. Trevor waits for him to catch up, then pulls an extra rake out of the back of the cart, handing it to the breathless little boy. It's not an uncommon sight, anymore- one or both of these little men typically "work maint'nence" a few afternoons a week- but it catches me every time. Takes my own breath away a little. 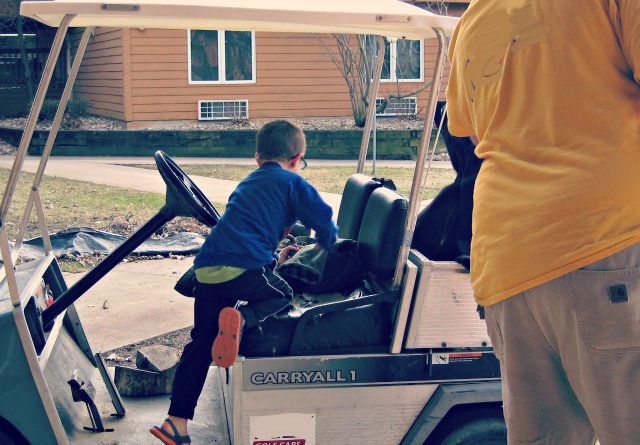 They love it- all the golf cart rides and walking around, but also the stick-picking and the nuts-and-bolts organizing. Sometimes, when their parents call them, they huff a little before moping home. I love it, too: watching their eyes light up as he smiles down at them, how these little men square up their shoulders and stand a little taller when they're "working maintenance." 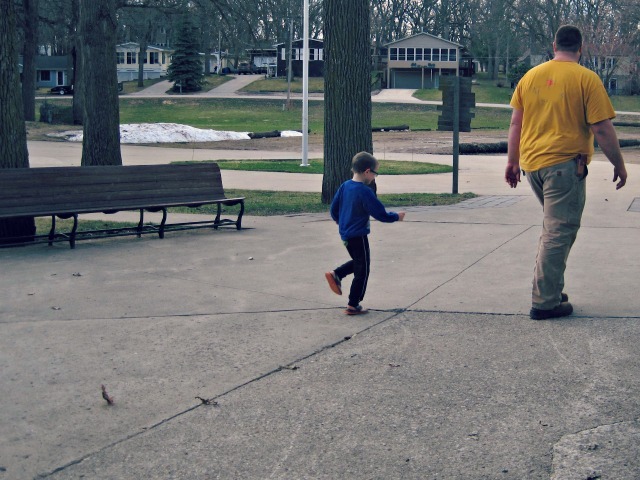 And I love watching him, too- how my husband takes the physical safety of these little boys so seriously, but even more so, how he takes their innate maleness seriously. He understands that there's something in the hearts of little boys that drives them to jump in puddles and handle tools and to be challenged. How they need to feel important and valuable and necessary. It does my heart good to watch Trevor working with his little tag-along friends. I love him more for it- for his patience, for his sense of humor, for his love of these little boys. I love Him for it, too- for giving me these small moments, little glimpses of goodness and rightness and kingdom-ness. God is good, all the time. I just think this is so fine. I love it when men take the little ones to heart and care about and for them while teaching them how important they are and how special they are. Children are a delight and need to be allowed to be themselves as best as possible. I never had children, but have taught hundreds and love them each and all. I like to see them bloom and blossom. I take my hat off to your husband. We also don't have children, and there's something about watching my husband make a small impact on these little lives that heals a part of my heart that I didn't know was broken, you know? He's so great with kids- and he really treasures them. This would melt my heart too!!! I love how little boys want to help out around the house, or yard. Your husband is a great example for the boys, God bless him!!! It's just so cute! And I love how seriously he takes them-- he gives them some pretty important jobs- ones I wouldn't consider for an eight-year-old, you know? But they do it. And they love the challenge! Aw so sweet. I have two boys and they're always wanting to help out with projects. It's awesome. Oh, so sweet, Danielle! Thank you for stopping by! It certainly has been a great fit for us! Boys need men! Great example here. From Keeping the Good linkup. As a mom to 2 boys (now teens), I love this! Boys need the men in their lives to invest in them. Thanks for sharing. I'm stopping over from the Grace & Truth link up!